101 inches wide by 110 inches long -- $945. 95 inches wide by 110 inches long -- $795. 101 inches wide by 111 inches long -- $945. 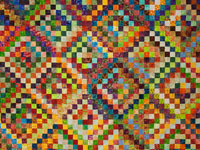 This is a brand new quilt arranged by C Jean Horst that is so exquisite with its hundreds of yards of hand quilting thread - this one has 693 yards of hand quilting with 8-9 stitches per inch - roughly 200,000 stitches!!! It is exceptionally heavily hand quilted with feathers - large and small, and also a charming and beautiful heavily quilted border design. The cream background, even though it is a tiny tone on tone 100% quilter's cotton print, shows up all the stitches and designs so nicely. While being a traditional patchwork pattern, Jean has transformed it into an heirloom quality quilt due to the exceptional yardage of hand quilting displayed. Our friend Mabel's quilt: Your bedroom's focal point will be this peacock fan quilt with it's gorgeous display of fans and loaded with color. 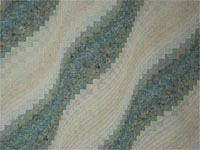 It is unique and eye catching with it's shades of peacock blues. The lavish design will be the star of your decor. 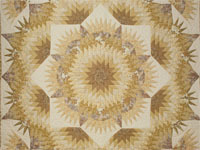 This quilt works into contemporary or traditional decor. It is 100% cotton fabric on the top and on the backing. 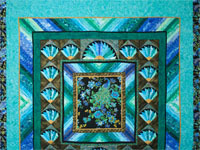 The center peacock design is a printed panel that is worked into a pieced quilt top. Gorgeous and unique. Mabel and her friends outdid themselves on this design. 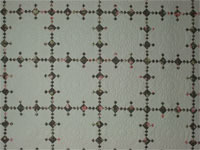 Look closely at the pieced areas that are show in the photos for your inspection. 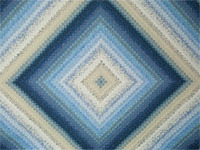 This is a high impact quilt with a blue backing of 100% cotton fabrics, and 7 stitches per inch. 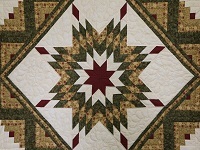 Our friend "Mabel and friends quilt" Here is an amazing combination of diamonds and star points all coming together to make a beautiful Compass Star. 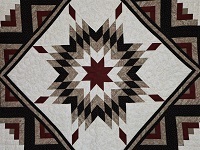 This quilt is 100% cotton fabric on the top and on the backing. 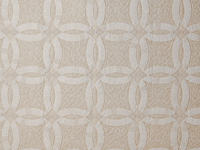 The impact is beautifully subtle with its blended fabrics in shades of golds. 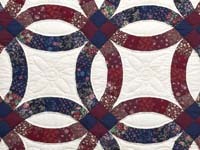 The hand quilted stitches are even with 6-7 per inch. A corner tag may be added if you would like the documentation on the quilt. Just let us know you would prefer the tag added.